Welcome to the Kora Ladies page! Please look around, and explore below. Also, feel free to click this link sign up for the Kora Ladies Konnection emails! Every year, the First Lady (Potentate’s Significant Other) raises funds for a specific project. 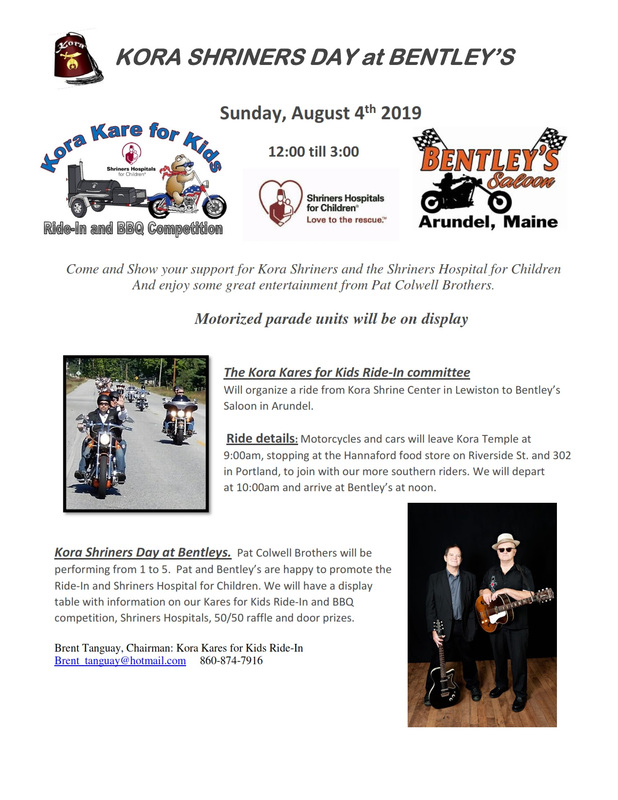 The Imperial First Lady, Patsy Cain, is raising funds to support the Pediatric Orthotic and Prosthetic Services (POPS) program of Shriners Hospitals for Children. Find out more about Lady Patsy’s program here! Open to the Public! Light refreshments will be provided. Everyone is invited to come enjoy your favorite marches, show tunes, and other great music as Kora Band hosts an indoor afternoon of “Music in the Park” featuring Southern Maine’s finest community bands! Click here for dates and information about this year’s Feztival of Trees. This fund is administered by the Potentate and Board of Directors. A $500 scholarship will be given each year to a student continuing his/her education. To apply, the student should send a letter to the Potentate detailing his/her plans to further or continue his/her education. Include the reason he/she selected their field of study and their plans for after graduation. Preference will be given to a Noble and his family, but is open to any qualified student. The scholarship will be awarded in summer, 2019 and available for the following academic year. Estimated cost at this time will be $650 (US) Per Person Plus Cost of meals. Don’t forget your Passport or Passport Card! All registrations must be completed and returned to the KORA Recorder by March 1, 2019. $50 per person deposit required. Payment in full due by June 15. 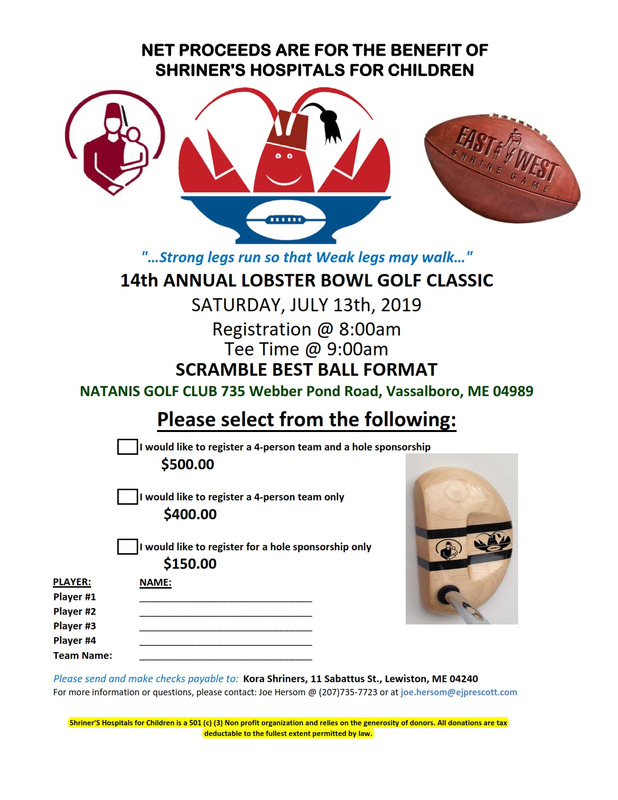 All net proceeds from this event directly benefit Shriner’s Hospital for Children programs in Boston and Springfield Mass. 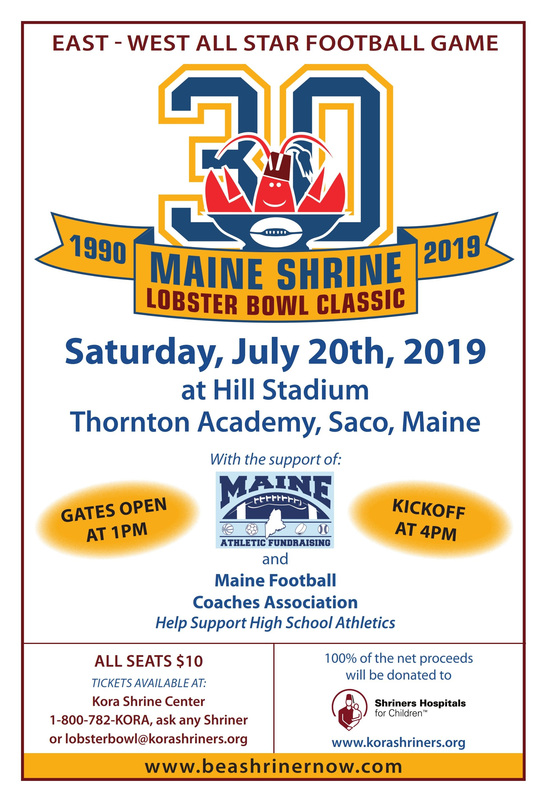 This event also contributes to the Kora Hospital transportation fund, which provides transportation for Maine Shriner’s Hospital patients and their families to the Hospitals. Friday evening; Shriner’s Social and Barn Dance with DJ Ron Parker. Saturday; a scenic escorted Motorcycle Ride, led by the Widows Sons, an ATV trail ride, led by the Kora ATV club and a People’s choice Classic Car show. All rides depart and return to the event site for door prizes, food, BBQ competitions and fun with the Kora Shriner’s. Chaps Saloon will be there with their famous portable bar and live music from Hurricane Mountain. Sunday; the KCBS BBQ Competition with over $8,000 in cash and prizes. BBQ competitors from across the country and Canada will be here to try their best to win and support a great cause. Ride Ticket: $20 for driver, (no charge for passengers) and includes; Ride (ATV or Motorcycle), Door prize ticket and a 2019 event shirt. Pre-register for the Ride by August 15th to guarantee shirt size, men’s or ladies. Admission only for visitors: $5.00 parking fee to enjoy the day with the Kora Shriner’s and a great Hurricane Mountain concert. The event is open to the public and all are welcome to attend. On-Site registration and debit payment will also be available at the event. 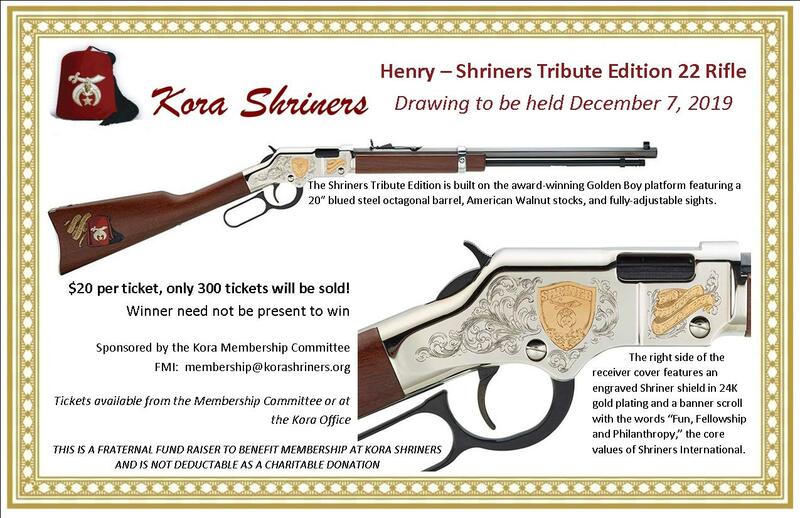 Click here to see photos from Kora Shrine events from 2013 through current. Lady Amy Doyle (pictured above with her husband, Bob) has done a fantastic job taking photos at events and keeping them organized and available for viewing! Thank you, Amy! Find the Kora Sands here!